It's Friday, the last day of April . . . can you believe it?? 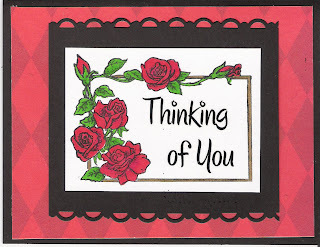 Carol, here, with a clean and simple card. Those of you who have been following the QKR Blog probably already know that several of the members of the design team have received their stamps to create projects during the month of May. 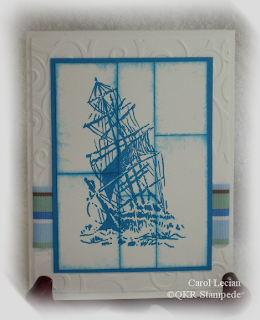 One of the stamps I chose was the Large Ship. Unlike the other images for which QKR Stampede is known, this stamp is not cute or quirky; rather, it is a beautiful image of a sailing ship. 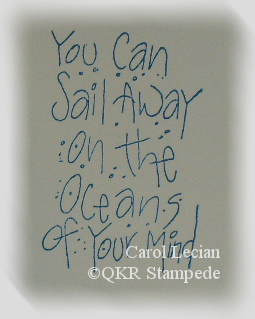 If you haven't checked out all of the wonderful images at QKR Stampede, you really should . . . there's something there for everyone! 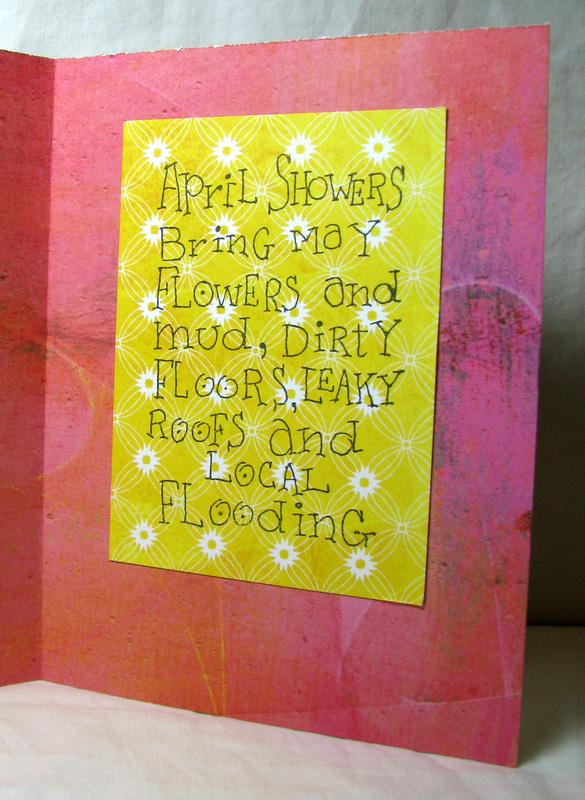 The card I created uses a technique called Aged Tiles and is clean, simple, and easy (quick!) to complete. 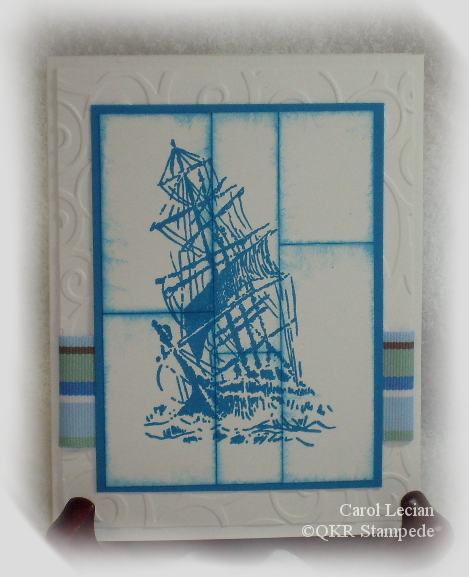 For the inside of the card, I simply stamped the Sail Away sentiment. Did you read that sentiment? I mean REALLY read it? ROFL!!! That sentiment cracks me up! 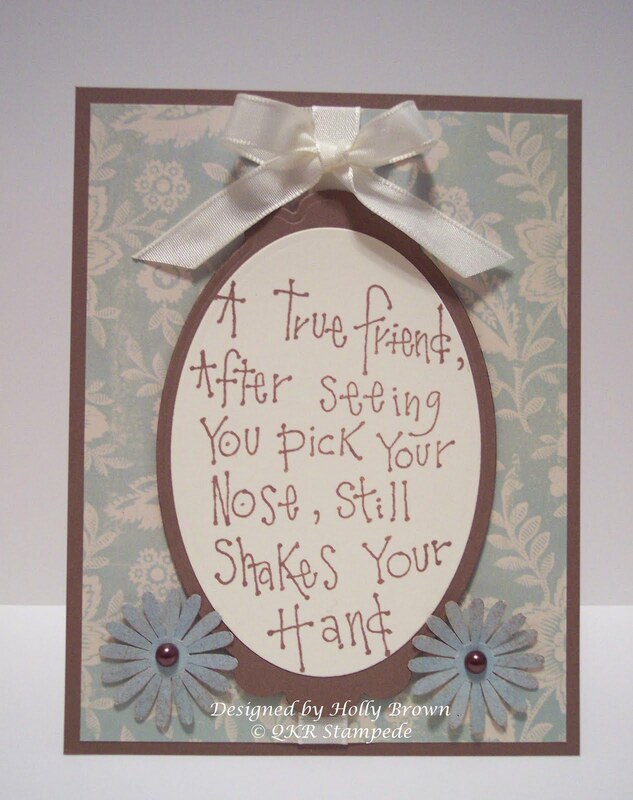 When I saw this in the QKR Stampede store, I just knew I had to make a pretty and girly card for this sentiment and see if anyone really READS it. Hi and Happy Wednesday everyone. This is Laralee and it is my turn to post. 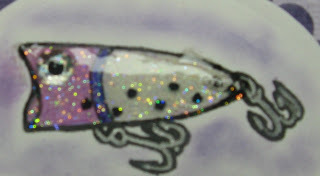 This is the card that I did for a friend's birthday and he is an avid fisherman. I just LOVE this image and this saying. They are both from the "stampede's" wonderful stamps and just a couple of the ones that will definately work for a man seeing how Father's Day is coming up right around the corner.....and let's face it we all have a male somewhere in our lives that need a card now and then. I colored this image with my copics and a couple of my Tombows. Hope you all enjoy it and get inspired for the male in your life. Have a great day and be sure to come back all week long and everyday from now on, we now have our schedule worked out (BIG THANKS TO CHRIS AND MARIBETH). Hello everyone! It's Jerusha, and it's my turn to post here at QKR Stampede today. I am excited to share my first card here with you. I've created some others and you can check them out on my blog. I post each Monday there, and every other Monday here so stay tuned! I have two boys of my own and they just love their Daddy. They want to be just like him! When I saw this little guy it made me think of that. I've used the Little Boy stamp for this card. 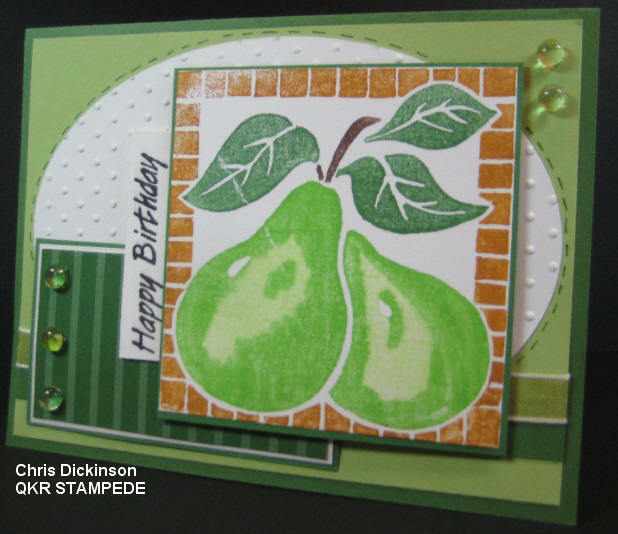 I thought I would go with a blue and green colour combo for this card. I've used some Glimmer Mist to create my own patterned paper - it is really fun to do because it looks different every time! This card would be great for Father's day, or anything, really! It is just a fun and quirky stamp. I know it will get a lot of use! Just imagine the things you can put in his outstretched hand - hmmm...that might have to be an idea for a future post. So stay tuned! My turn for a Saturday card at QKR. Visit their shop to see a lot more of these beautiful ragdoll stamps. Hello! Jenn K here! Today is my first post!! Woot! Woot!! I am excited to be here to share a few cards I created with these FUN stamps!! 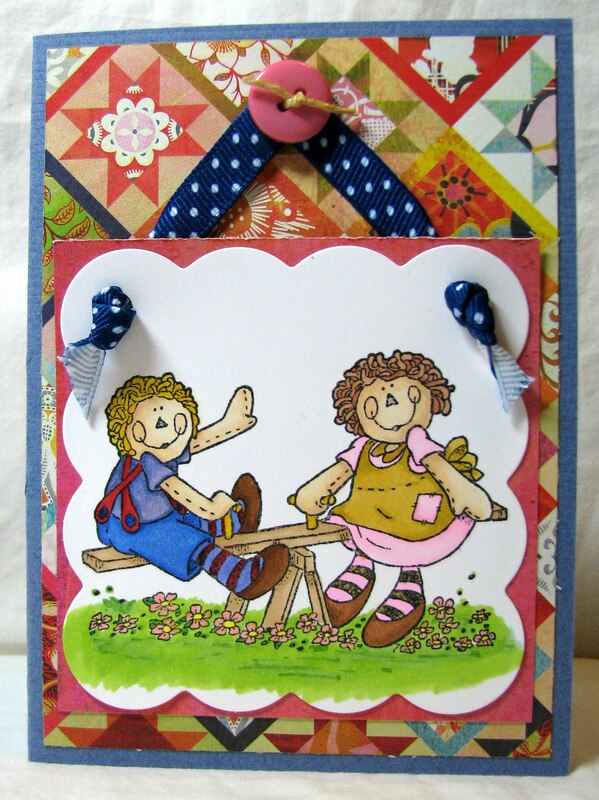 The first card I created with the stamp "At the park". 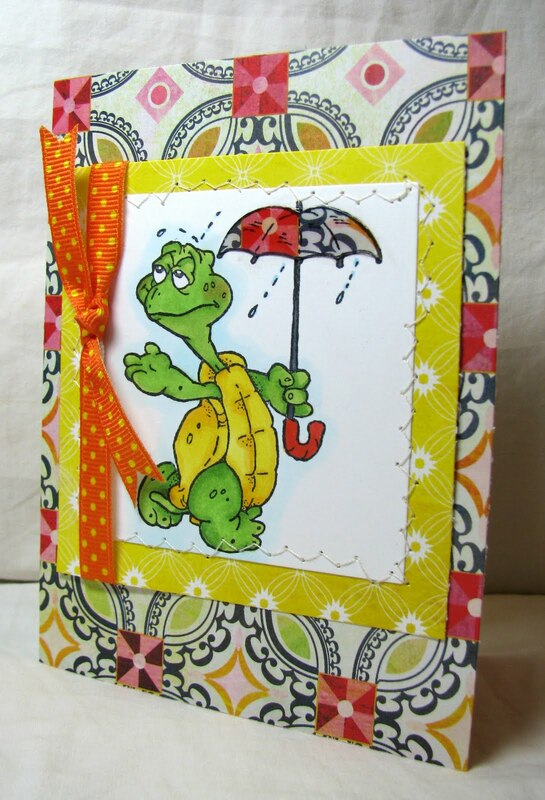 This image is lots of fun to color and could be used for so many different types of cards. The sentiment I used is called "Ups and downs" and is so true. 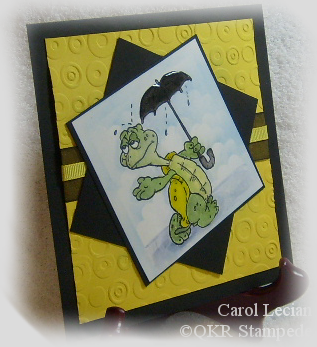 The next card I created uses the Cutest little turtle stamp called "In the rain". I paper pieced his little umbrella. Isn't he CUTE?! I really hope you enjoyed my first post and my cards today. 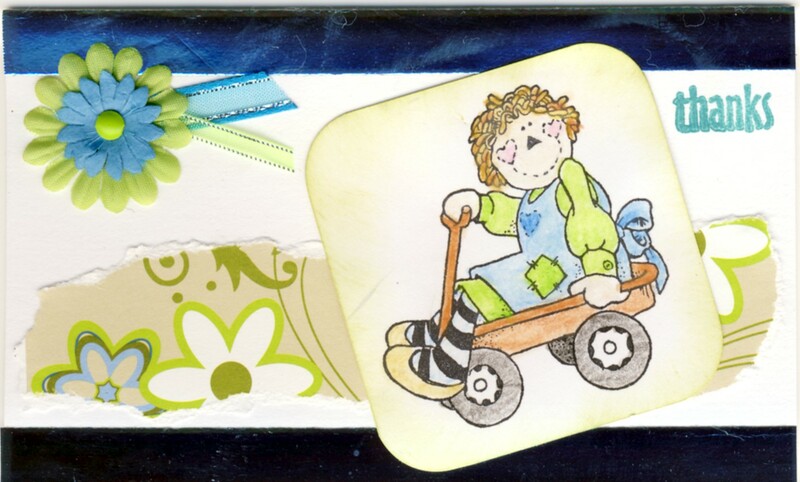 I will be back soon to share some more Fun projects I created with these Super Cute stamps. Happy Thursday to you all! Jessica here with you today. I am coming to you today from Virginia. I am "down" here (it is South from my home) visiting my brother and his family. My little baby nephew is just ADORABLE!!!! I do miss my DH though...he had to stay home and work. 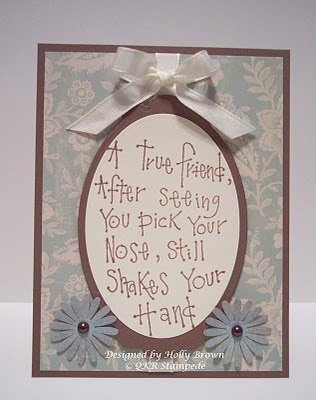 Well, enough rambling, and on to my card for you today. So I have been trying to experiment with different colors and sizes lately. I tend to use a lot of pinks and purples, so I am trying to stray from the norm a little. I also recently purchased some white ink...which is soooo fun if you have never used it! It just adds such a nice look to darker colored CS. 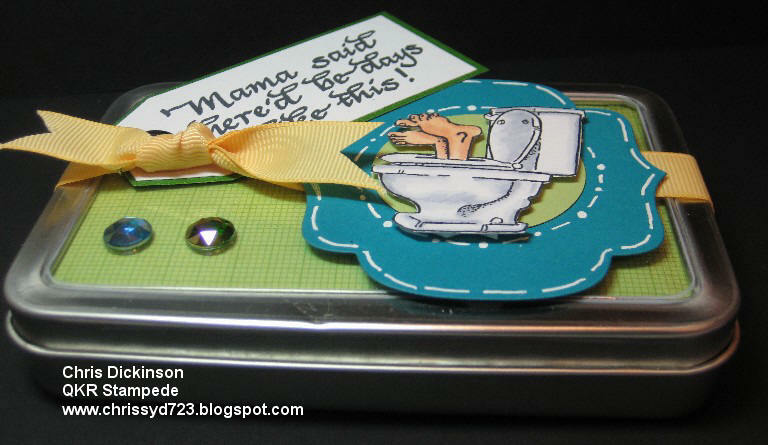 As far as size, I made this card 4" x 4", instead of the usual 5 1/2" x 4 1/4". I stamped the Happiness Comes image with white ink onto brown CS. I added some color using colored pencils, which also added a neat look...well at least I thought it did...lol. 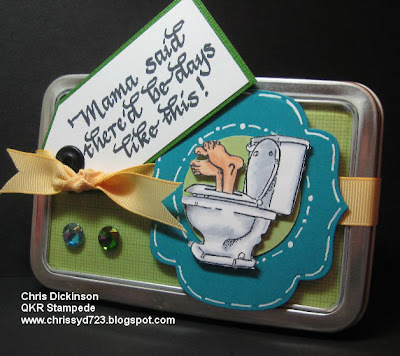 I then layered the brown CS onto some brown and cream PP which I used a border punch around. This is the first time EVER I have been able to do border punched squares right! Last, I added a couple eyelets and threaded some brown ribbon though and added a bow. Well that is it from me for this week. I hope you check back here often to see what our DT ladies have created, as well as stopping by their personal blogs. Barb Best here - today I decided to do something a little different. As I was digging through my 'stash' I found this chipboard book. with some sandpaper to distress it a little. 'Sad Puppy' in black ink on the red paper. I colored him with my Prismascolor colored pencils. I just love how the dark colors make the other colors just pop! After I got done coloring and adding accents with a black glaze pen, I layered onto two different papers. I then adhered it to the front of the card. Then I took the stamp 'It's a dogs life' and masked the image. I stamped the first two words above the puppy. I then masked again and stamped the last two words under the puppy. I then enhanced the words with a glaze pen. I took a chipboard tag and colored it with Distress Ink. I wrote Harley's name with a Signo pen. 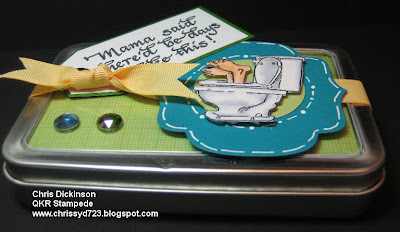 I then added a layer of Glossy Accents to the tag. I added ribbons to the ring. what ever you choose to do with it! A nice way to remember a special dog. 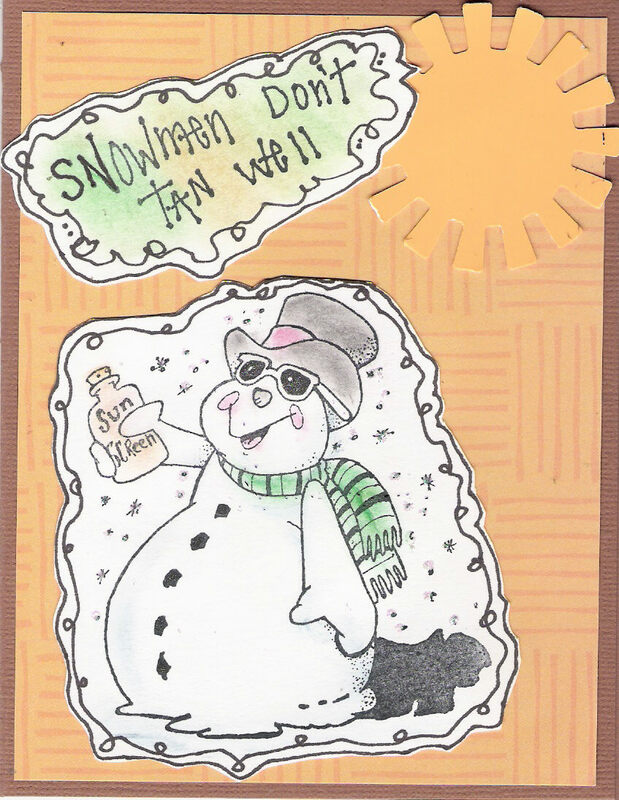 Here is Mr Sam the Snowman trying to get tan-again. This time I used chalk to color him in, and the snowflakes have some stickles to make them stand out. The sun is a punch. Red roses are so pretty. I love this little frame of roses. It is colored in with Sharpies and the words are a rub on. Then it is matted on black, red printed paper and a black card. This is Chris from Wisconsin enjoying the Spring weather! I hope that you are enjoying your day too! 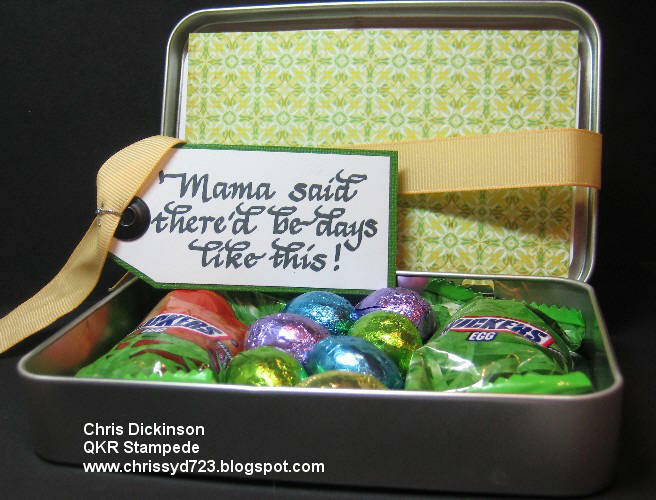 Todays project uses QKR STAMPEDE images. I personally do not use solid images often because I love to color - but this Pear image was fun to use my water based markers to add a little more pizzaz! QKR Stampede offers you a great variety of different images for all different styles AND best of all they are VERY AFFORDABLE!
. . . and Gene Kelly? 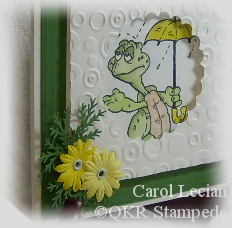 When I saw the In the Rain stamp by QKR Stampede, all sorts of possibilities came to mind, one of which was the rhyme, "April showers bring May flowers." For this card, the image was stamped and watercolored. The green mat layer was double scored on all four sides. I used my cuttlebug and the Spots and Dots embossing folder on a piece of white card stock that was cut the same size as the focal image. After embossing, the scallop circle was cut out using a circle scallop Nestability die. The embossed piece was applied using pop dots, then paper flowers and punched branches were added. A close-up view of the details. Another thought that came to mind was Gene Kelly and his dance sequence in the musical, "Singin' in the Rain." This little guy has donned his rain shell slicker and his umbrella and is walkin' down the lane . . . For this card, the image was stamped and watercolored. Crystal lacquer was added to the umbrella and the rain shell slicker for a "wet from the rain" look. The Cuttlebug and Spots and Dots embossing folder were used on the yellow mat layer. 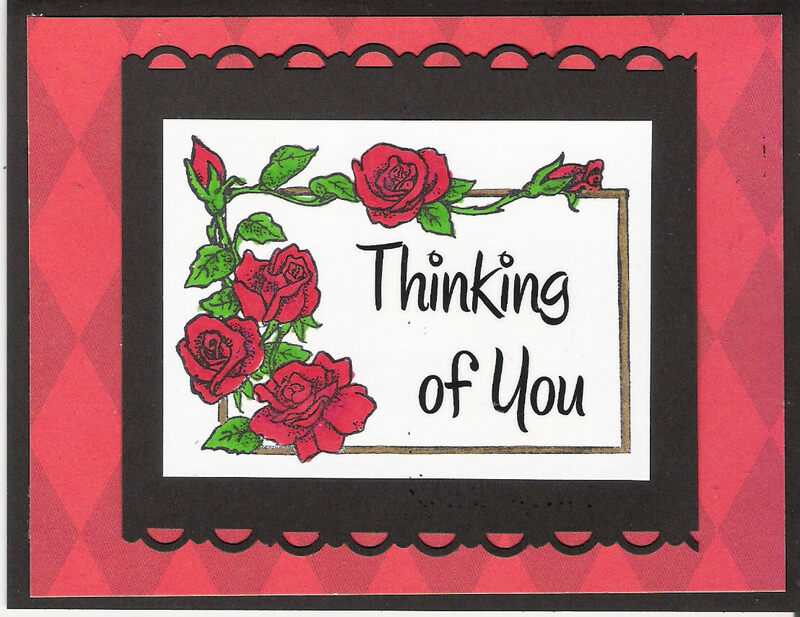 Black organdy ribbon and a yellow grosgrain ribbon were added across the middle of the card. The clouds were sponged. 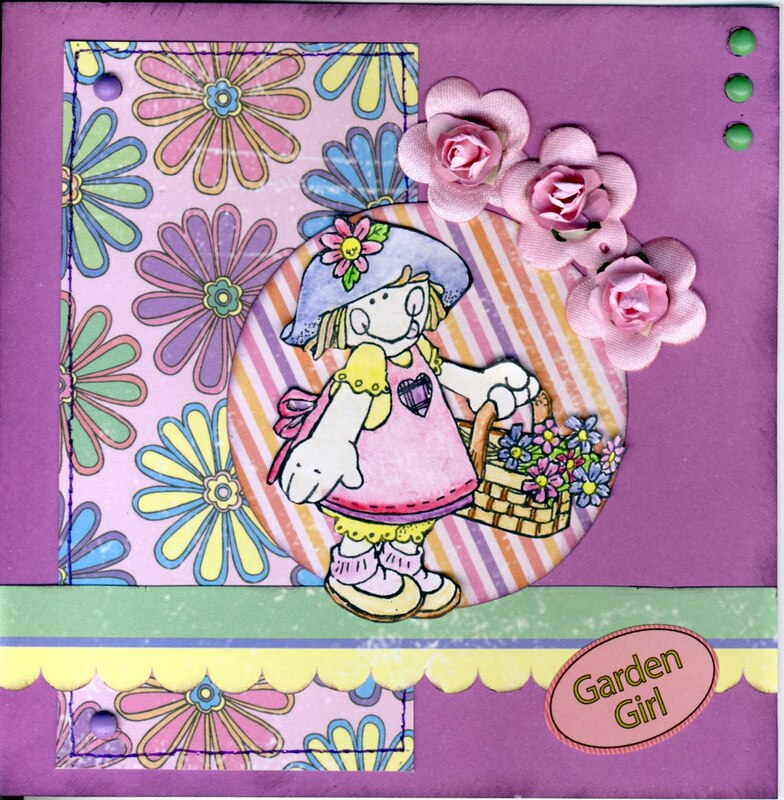 Hope you have a wonderful cardscrapping Saturday. 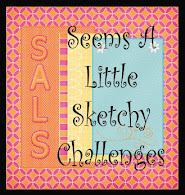 Ohh what a FUN Blog Hop! I know that I enjoyed seeing everyone's creations! Thank you all for hopping along! Theresa - please contact Mary Ann with your $30- shopping list and shipping information and she will get those materials to you. WELCOME to the QKR Stampede RIBBON CUTTING CEREMONY! 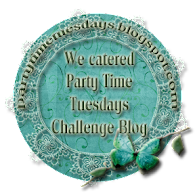 We are so excited to be holding our FIRST BLOG HOP and glad you have come to join in our celebration! I personally have had a "stinky" kind of day with our septic system backing up into our basement, so how fitting is this image? It makes me laugh, even though we have a huge mess in the basement. You will have an opportunity to win a $30- Shopping Spree from QKR Stampede! This is what you have to do... HOP through AND comment on each blog - THEN come back here and let us know you did so! The Deadline for entry will be Sunday, April 11 at midnight EST. I will announce the winner on Monday, April 12. I am so excited to have been asked to be on this great Design Team. Let me introduce myself. I am Laralee Ganske, I am a SAHW, a mother of 5 grown children, and grandmother of 10 and 3/4. I have been crafted forever, but I have only been scrap booking for the past 7 and stamping has become a passion VERY recently. I am a very simple person. I hear all of the time that scrap booking and stamping is just tooooo complicated. IT DOESN'T HAVE TO BE. What matters is what comes from the heart. I finished a couple of projects, but one is special for the blog hop so you will just have to wait and see. Be sure to stop by all of our blogs on the way through the hop on APRIL 9th. I know that I am going to have great blog candy to win on mine. SEE YA SOON!!!!!!!!!!! Row, Row, Row Your Boat . . .
. . . gently down the stream. This cute little guy, Out at Sea by QKR Stampede, appears to have strayed from the stream and wound up in the open sea. 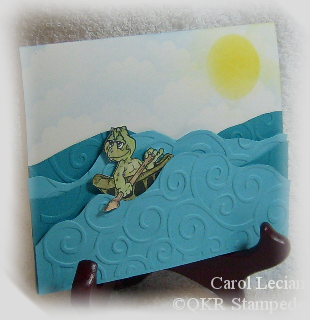 I thought this little guy would be darling depicted bobbing along in the waves in his shell boat. 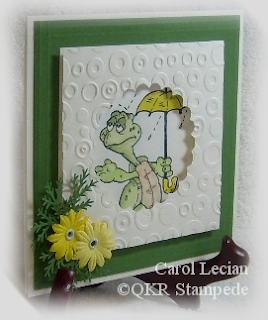 As with the other stamps offered by QKR Stampede, this little guy is absolutely adorable and the creative possibilities are endless! Be sure to check out this and the many other "somewhat cute, somewhat quirky" stamps offered by QKR Stampede. Thanks for stopping by and having a look! Enjoy your day! Hello everyone! Barb Best here - thought I would take my turn at posting to our design team blog. 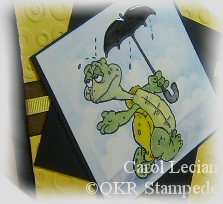 It's been fun using my new stamps from QKR Stampede! I'm looking forward to our first blog hop as well! Today I am sharing a couple of cards I made using the stamps Splatted Bug and Sometimes. I used a touch of Diamond Glaze on his eyes just to pop them out a little. For this card I made a 5" square card, cut a piece of background paper 5" square and attached it to the back of the front of the card. I then folded the corner back so the background paper shows. I added a couple of brads to hold it in place. A little diamond glaze on his eyes. Image is colored with colored pencils. There are so many to choose from. Check it out! I am so ready for spring and I am glad it finally got here, or so it seems. My card share uses the stamp Flower Blossom. This stamp is so versatile because you can use so many colors on it. I chose pink because it is one of my favorite colors. I added some stickles and glossy accents to give it a shine. 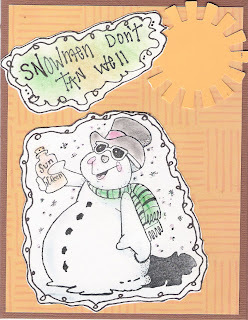 Here is my really tan snowman, embossed in black and watercolored on wc paper. The darling olive mice is stamped in black, and colored in with markers. The rose tag is double stamped in black and the rose portions watercolored, then one is cut and popped over the other. I then highlighted the roses with a glossy finish, and stamped friend in the box. The black strip has a punched buckle on it. If you have ANY questions on technique or supplies, just ask.